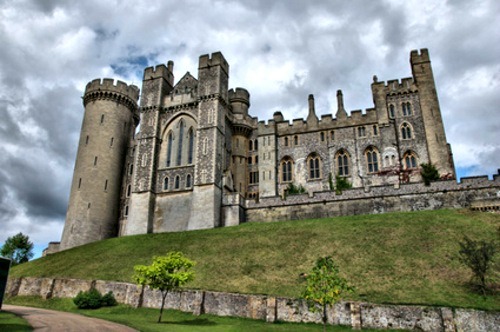 Arundel castle was on Christmas day 1067 by Roger De Montgomery. The castle was constructed on the orders of William the conqueror as a defensive site against French invasion and Roger De Montgomery became the first earl of Arundel under the graces of William. Originally constructed as a motte and double bailey castle, the site saw many additions and improvements over the years, with the first being the construction of a stone wall around the motte to replace the palisade wall on the orders of William the conqueror himself. The castle passed into many different ownerships during its time and during the 1600's until the late 1700's the dukes of Norfolk preferred to maintain and build onto other preferred estates, leaving the castle under funded and falling into a neglected state. It was Charles Howard who was the 11th Duke of Norfolk who began a huge restoration and improvements project on the castle in 1787 which lasted several years. After the royal visit of 1846 the castle saw other major changes to its structure and lands, finally being completed in 1900. As with the vast majority of castles in the UK it is a registered historical building and opened to the public who may walks most of the castles grounds and rooms, minus a few private areas. Please check with the castle to find seasonal opening times and events. There are thought to be several main ghosts who haunt the castle, though various psychic and ghost hunting groups who have visited the site disputed the exact number. Who or what the spirits are seems to be something which will never truly be known as there would have been a huge number of deaths in or near the castle due to how long its been there. The most notable ghost id thought to be the spirit of the first Earl of Arundel who was the first holder and builder of the castle. His apparition has been seen within the keep area and he has been known to make loud thumping noises on doors and the echo of footsteps from empty corridors. The next ghost has been described as the mist like apparition of a man in a blue glow. Referred to as the "blue man" he has been seen in the library area since the early 1600's and is thought to be the spirit of a cavalier who died in the castle. There is also claims of sightings of the spirit of a servant who is thought to have lived in the castle. When he lived or who he was is unknown, as the names of peasants who worked for the castle were in early times simply not worth recording on paper due to how often and easily they were replaced. He has been seen in the kitchen area scrubbing pots and even sweeping in the hall ways. The next spirit is said to be of a young woman who killed herself by jumping to her death from one of the towers. She was thought to be overcome with sadness from a tragic love affair which didn't work out well, Seen by some, she is said to still haunt the castle on moonlit nights dressed in a long white dress. The most notable and my personal favorite haunting of Arundel castle is that of a strange white spirit which manifests itself in the form of a strange owl like bird. The local legend states that if the bird is seen flapping its wings in a particular window, there will soon be a death of one of the castle residents. Interestingly before the castle was restored in 1846 the Dukes of Norfolk kept a colony of white American owls in the grounds. Having an animal ghost is very unusual, but legend tells that it is in fact the spirit of either someone who died in connection with the castle or another, more other-worldly being which choose to manifest itself as an owl.